Citation Information: J Clin Invest. 2007;117(4):1037-1048. https://doi.org/10.1172/JCI30182. 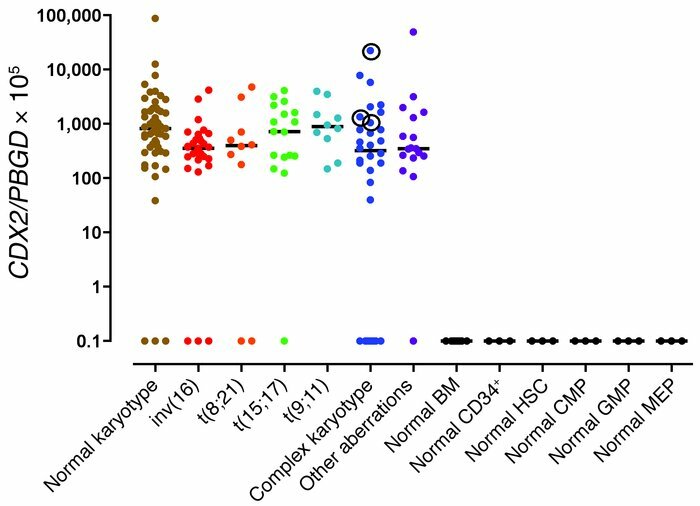 CDX2 mRNA levels were measured by RQ-PCR in 170 AML patients from different cytogenetic subgroups, as well as in BMMCs (n = 10), CD34+ cells (n = 3), HSCs (n = 3), CMPs (n = 3), GMPs (n = 3), and MEPs (n = 3) from normal individuals. Circles indicate patients with genomic amplification of the CDX2 locus, as assessed by aCGH and FISH (25). Bars indicate median values.